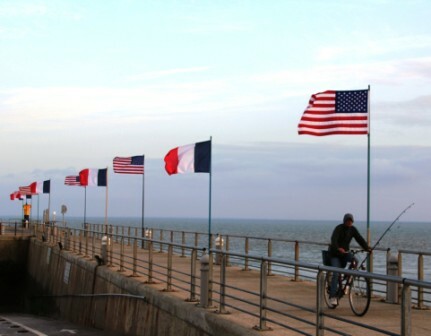 This was my favorite of the recent visit to France’s mid-Atlantic coast. See previous post, “Discovering more of France,” June 2015. Islands are intriguing. These chunks of land surrounded by water are a curiosity, and much more. They inspire and captivate our imagination, offering a unique way of life, a different state of mind. The miniscule French island of Aix off the country’s mid-Atlantic coast is indeed an island pearl. Step off the ferry from the mainland and enter an enchanted world – no cars, little commerce, just one hotel. Aix has not been gussied up for tourists. It’s authentic with many buildings in need of a coat of paint. Its few shops seem to have changed little in decades. There are no fancy restaurants, no classy cafes – just a small number of simple eateries. About 240 residents live on the island which is 1.8 miles long and .4 miles wide. 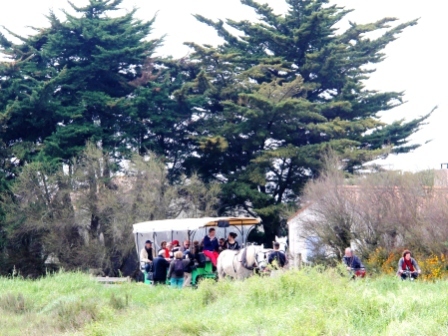 Of the permanent inhabitants, only 100 remain on the island in winter. In summer, between 4,000 and 5,000 tourists arrive each day to bike, walk, swim, fish and soak in the beguiling island ambience. Most leave in the evening. The nights are silent, magic. “I come here every chance I get. 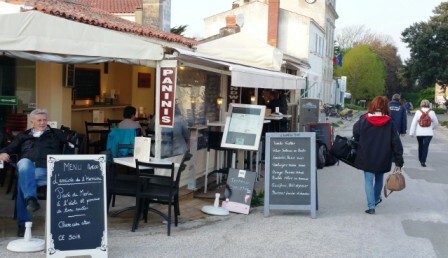 It’s a little paradise,” said Christine Lacaud who lives in Rochefort, a city in the Poitou-Charentes region adjacent to the ferry departure point in Fouras. Aix harbor decorated for the departure of the frigate Hermione to the US. The magnificent ship was just one attraction. We also biked. 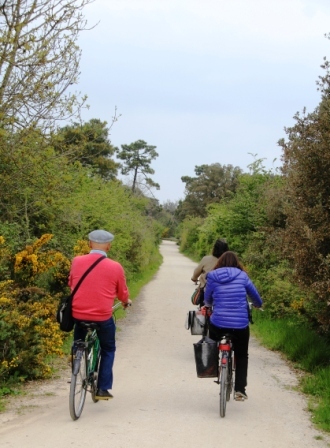 You can walk around the island in two to three hours, or take a leisurely horse-drawn carriage ride, but discovering Aix by bike seems to be the most popular. 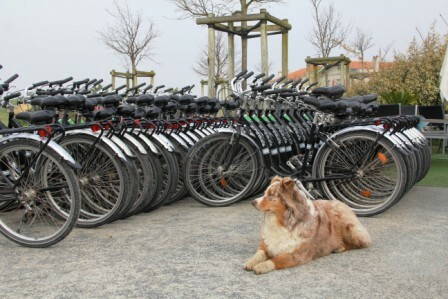 There are several bike rental depots. Ride through lush forests, marshlands, along a rocky coast, past pristine beaches and hidden coves. It’s tranquil, peaceful — and flat. Pedaling is fun and easy. Stop for an oyster break. 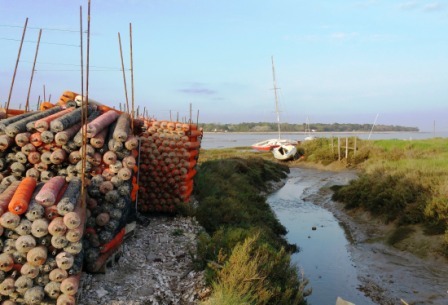 Aix’s one weather-beaten oyster shack should be on a movie set – the perfect oyster shack stereotype. Oysters are shucked on the spot. 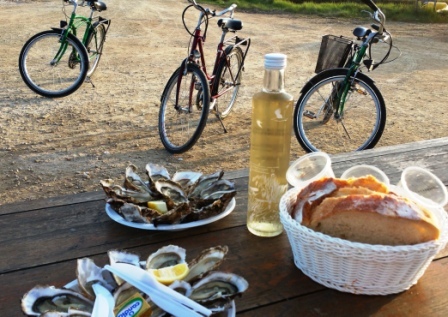 Order a bottle of white wine; sit outside surrounded by stacks of oyster-growing paraphernalia, bikes and the sea. Oysters have never tasted better. 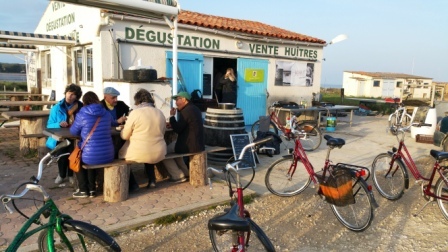 Aix’s deputy mayor, Jean Claude Poisson, told me the island doctor, who lives there year round, does big business in summer thanks to oysters. Tourists comb the shore looking for the mollusks and cut their feet on the razor sharp rocks. The doctor is kept busy stitching wounded feet. A wealthy American, Eva Gebhard Gourgaud, gets credit for Aix’s revival in the 1920s. The island, initially settled by monks in the Middle Ages, played an important role in France’s military history throughout the 18th and 19th centuries. During the Napoleonic period, several thousand troops were lodged in forts and barracks on the island. Napoleon even requested reinforcements of Aix’s fortifications after an island visit in 1808. But by the beginning of the 20th century, the military presence was on the decline. The island was dying. 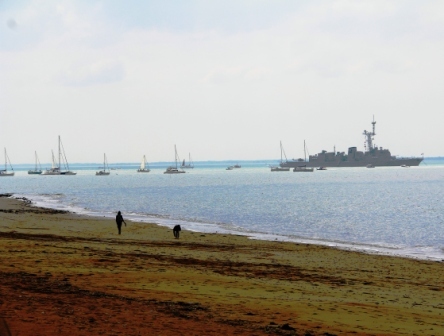 A French journalist wrote a report on the island’s imminent demise. 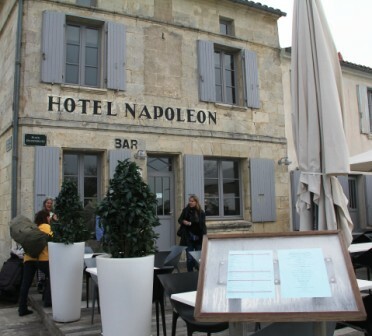 Eva, wife of Baron Napoleon Gourgaud who was a descendant of Napoleon’s aide, read the article, visited, and fell in love with Aix. ”She decided to buy everything.” Berniard said. She opened the island to culture and tourism. A tourist favorite is the house where Napoleon surrendered to the English in 1815, and where he spent his last three days on French soil before being exiled to St. Helena in the South Atlantic. This year marks 200 years since Napoleon returned to France after nine months of exile on the island of Elba. The house, which has displays on the Napoleonic era, is open to visitors, as is Aix’s Mother of Pearl House where proprietor Herve Gallet will tell you the fascinating story about the island and mother of pearl. His parents moved to Aix in 1948, hoping to grow grape vines and sell wine. That failed, so they started making objects of shells collected on the beach to sell to tourists. That enterprise took off, and they expanded to make products of mother of pearl. “There are 148,000 varieties of sea shells,” Gallet said, “but only 16 can be used for mother of pearl.” Mother of pearl was imported from India, Mexico, Polynesia and other countries, since shells from Aix are not suitable. Between 1720 and 1980, mother of pearl was a major industry in France, Gallet explained, with some 30,000 workers in the country producing buttons. On Aix, however, mother of pearl was used to make souvenirs and decorative items, not buttons. These are still made by Gallet. 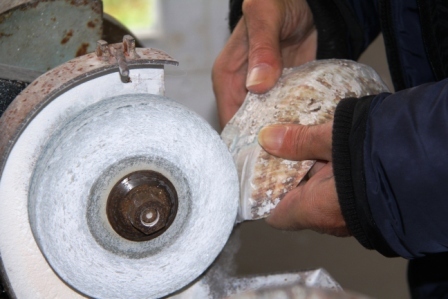 In his workshop he demonstrates the process of extracting and polishing mother of pearl from shells. His Mother of Pearl house is a type of museum where an audio guide and videos explain the biology and chemistry of sea shells. His shop offers an extensive range of mother of pearl products, from reasonably priced jewelry items to a mirror with a price tag of 1,750 euros. I bought two pairs of earrings — a pearl souvenir from a pearl of an island. Try my aioli — the recipe featured in Today’s Taste in column at right. Yes, it’s a rough life…I have been lucky. So much to see and discover, and this island is really a bit of paradise. Come back to France. Come and see us. Hi Heather. I am so glad you enjoy my blog. Thanks for the comment. Thanks again for taking me on a delightful journey – a nice way to start my day on a cold winters morning in Melbourne, Australia..! Utterly charming it is….and yes, you get credit for “addictive” on the aioli. Thank you. Thank you for being such a loyal TandT foillower and for all the great comments. Aix sounds utterly charming and laid-back: my kind of place. Love the bike picture, partially because I’m a sucker for Aussies! And thank you for generously sharing your wonderful basil aïoli recipe. I think I was the one who called it addictive! Thanks so much, Odile. 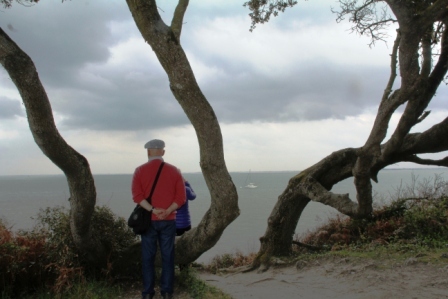 We have been to Bretagne and loved it, but long ago. It’s time for another visit. We will surely look you up. each post is a true “régal”, merci Leah ! 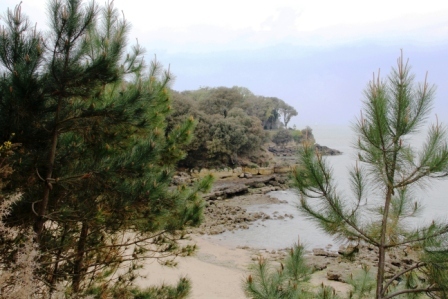 hope you will soon come to discover our both pretty and rough Bretagne. Don’t miss to inform us !